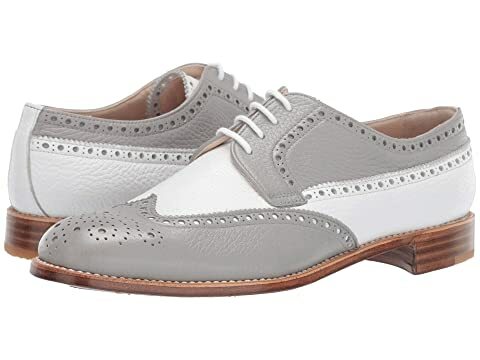 Make a bold statement that will not be soon forgotten in these Gravati™ Wingtips! We can't currently find any similar items for the Calf Leather Wing Tip by Gravati. Sorry! Gravati is old world shoe making at its best. The quality of materials, construction, comfort and consistency of fit is exceptional. I collect them as the works of art they truly are and for their timeless classic styling. I own a couple pairs of Gravati shoes, and it is true that they are beautifully made shoes. I don't have this pair, the colors are a bit too limiting for me. But I can't recommend this brand highly enough, though I usually have to wait for a good sale or extra income to make the splurge. I have never regretted the purchases, however, and always get many compliments when I wear them. Italian shoes crafted in the finest styles. The used to be a time when Ferragamo shoes were made this way, but that was a long time ago. Gravati seems to be the only company who still takes pride in leathers and craftsmanship. Sad, but that is the way it is. Love these classic shoes. Love these shoes! I’m surprised at how comfortable they are! !